Buyers’ agents can legally share commission with customers. What’s difficult is executing this without disrupting your deal or upsetting the other party. That’s why discretion is so important when choosing a buyer’s agent. Traditional partner brokers who never openly discount. Discreet buyer closing credit at close. We’ve helped buyers just like you save millions of dollars on home purchases since we opened our doors in 2014. We pair you with an experienced, brand name, local partner broker who will not only provide you with great advice but who has already agreed to discreetly write you a check for up to 2% of the purchase price. Best of all, because our partner brokers never openly discount their services, they have great working relationships with the real estate community. You’ll never have to worry about your broker disrupting your deal rather than the industry. We pair you with an experienced, local partner buyer agent who will not only provide you with great advice but who has already agreed to discreetly write you a check for up to 2% of the purchase price which comes out of the commission paid by the seller. 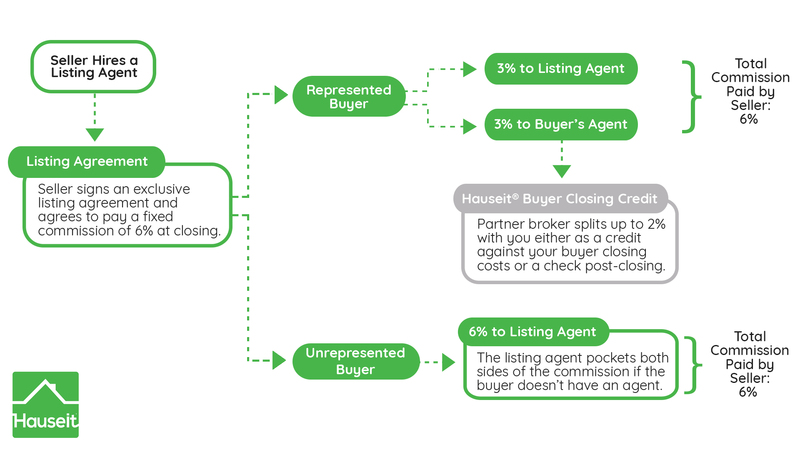 A seller in NYC typically agrees to pay a fixed total commission upon closing which is meant to be split equally between the listing agent and the buyer’s agent. If you are unrepresented, the listing agent simply collects both sides of the commission: meaning neither you nor the seller save any money. How Much Could You Save with a Hauseit Buyer Closing Credit? Home buyers can save up to 2% of their purchase price on the average New York City apartment with a Hauseit Buyer Closing Credit. That means you can eliminate or substantially reduce your closing costs in NYC while receiving free assistance from one of our experienced partner brokers. Better yet, a Hauseit Buyer Closing Credit is completely legal and non-taxable. Just ask the New York State Attorney General and the IRS. You can earn a Hauseit Buyer Closing Credit on virtually any listing in the city. So don’t let a listing agent bully you into dual agency so they can earn double commission! Sign up today to learn more! Estimate your buyer closing costs with our interactive Closing Cost Calculator for Buyer in NYC! Why sign up for a Hauseit Buyer Closing Credit? I used their services to purchase and I could not have been more pleased. I was able to work with a team of agents who were very responsive, helpful and transparent throughout the buying process. I loved the transparency as I like to be involved every step of the way. Excellent experience and I would definitely recommend to others looking to purchase! Not only did my broker help me identify and purchase a condo in Manhattan, but they also helped me find a tenant in just a few weeks after we closed on the property. We were continually impressed by our broker’s never-failing, speedy responses; incredible work ethic, pragmatic, well-informed approach; enthusiastic, polite, positive, professional attitude! They were extremely helpful throughout the entire process! As first time home buyers, we were unfamiliar about the actual process and they gave us guidance from the search to the closing. They provided recommendations that fit within our guidelines, contacted sellers to schedule viewings, helped organize the co-op board package, prepared us for the interviews, etc. Real Brokers. Discreet Savings. You’ll always get the best deal through Hauseit, we guarantee it. If you find a better deal elsewhere, we’ll beat it. Plus, you’ll always be paired with a trustworthy, experienced, brand name real estate broker who never openly discounts so you won’t jeopardize your purchase. Why aren't closing credits and incentives more common? Savvy buyers understand that there’s no such thing as a free lunch. There’s a reason why buyer agent incentives aren’t more common. That’s because listing agents are loathe to split commission with discount brokers. It already stings to have to split commission, why put salt on the wound by also hurting the industry? Plus, there’s no point in getting any incentive if it’ll make the seller resentful. Why would you want the seller to feel like he or she is paying you commission? So how does one safely and discreetly receive a commission incentive from their buyer’s agent without jeopardizing their deal? By working with one of Hauseit’s brand name partner brokers who never openly discount their services and tarnish their reputations. As a result, our traditional, full-service partner brokers have great working relationships with the real estate community. Can I sign up if I'm already working with a buyer's agent? Yes! As a home buyer in NYC you should never sign an Exclusive Right to Represent Agreement which means you are free to switch representation at any time. If you are asked to sign an exclusivity agreement by anyone, you should run! It’s very rare for anyone but the occasional foreign buyer who is heavily dependent on their local representative to have an exclusive buyers agent. Can I sign up if I've already contacted the listing agent? Yes! You have the right to choose to work with the agent of your choice at any time. With that said, you won’t be making any friends if you’ve already seen the property with the listing agent and then decide to loop in a discount broker. Fortunately, all of our partner brokers are experienced, established traditional brokers who never openly discount their services. As a result, all of our partner brokers have their reputations and relationships with the wider brokerage community intact so you’ll never get treated any differently. Simply copy our partner broker on an email to the listing agent and explain that you’ve decided to enlist the services a dedicated buyer’s agent for your purchase. You can truthfully explain that you’ve done a lot of research and realized that you needed someone to guide you through the process who only works for you. Your closing cost credit can be our little secret! Can I sign up if I've already submitted an offer? It depends. If you’ve already submitted an offer directly with the listing agent or through another buyer’s agent, then it may be too late. It will be hard for our partner broker to be the procuring cause of the sale, and thus eligible for commission, if your offer has already been accepted. However, it’s not too late if your offer was rejected or if you plan on making a new offer on the same property or a different property! Is it legal for home buyers to receive part of their agent's commission? Yes, home buyer closing credits and incentives are completely legal in 40 states including New York State. It’s completely legal for a buyer’s agent to offer a portion of their commission as an incentive to home buyers, and it’s completely legal for home buyers to receive such an incentive. In fact, former New York State Attorney General Eric T. Schneiderman released an open letter to the real estate community on April 20th, 2015 urging all parties to take advantage of such home buyer closing credit programs and incentives. Ten states currently ban commission incentives offered by the buyer’s agent. Nine of these states have a full ban in effect due to strong real estate broker lobbying efforts: Alabama, Alaska, Kansas, Louisiana, Mississippi, Missouri, Oklahoma, Oregon, and Tennessee. The tenth state, Iowa, prohibits any such incentives when there are two or more real estate brokers on a transaction. Will my buyer closing credit be taxed as income? The IRS has issued an opinion letter stating that closing credits and commission incentives provided by real estate brokers are generally not taxable. As a result, you should not expect a 1099 to be issued to you as your closing gift will generally be treated as a concession on price, and thus a reduction of your cost basis. Please consult your tax adviser for more information. You can also view the specific IRS rule we referenced here. As a home buyer, you are never required to sign any sort of contract or exclusivity agreement. However, our partner brokers can send you a simple agreement for e-signature detailing how much they will pay you. This agreement is optional to sign and is for your protection! Our partner brokers will also send you a NY Agency Disclosure Form. This government mandated disclosure form is not a contract and simply explains whom your agent represents. You are not required to sign it but our partner brokers are required to present it. What properties qualify for a buyer closing credit? You can receive a Hauseit Buyer Closing Credit on all types of apartments in NYC, including new construction buildings, condos, co-ops, condops, brownstones, multi-family houses or any other building or land that is listed for sale. It’s important to clarify that our partner brokers can offer you this incentive on any listing in NYC, Long Island and the Hudson Valley even if it is listed by another broker. Many buyers think that this sort of incentive could only be offered on a broker’s own listings but that is simply not the case! How much is the buyer closing credit? New York home buyers can save up to 2% on their purchase price with a Hauseit Buyer Closing Credit. This means you can save up to $20,000 for each $1 million of real estate that you purchase. On the average NYC apartment where 3% in commission is being offered to buyers’ agents, this equates to 2/3 (two thirds) of the total buyer agent commission. Our partner brokers are very reasonable people, so please feel free to discuss your unique situation with them and tell them what works for you! No. You don’t owe us or our partner brokers anything at all because buyers’ agents get paid from a split of the built in listing commission. As a result, it is the seller who pays the agents on both sides. If you don’t take advantage of your right to free buyer representation, then you’ll simply allow the listing agent to keep both sides of the commission! Can I still search on my own? Yes. You are free to continue searching for listings online and even attending open houses on your own. Once you’ve found or seen a listing you want to put an offer on, please let our partner brokers know! Just remember to write the contact information of our partner brokers down on open house sign in sheets so listing agents know you’re represented. A further benefit of doing so is you won’t be added to newsletters and mailing lists! Will I have a full service buyer's agent? Yes. You won’t be treated any differently by our partner brokers because you’re receiving a buyer closing credit. Our experienced partner brokers will be there to guide you through your search, offer, contract and closing process. If you’re busy, our partner brokers can search for listings and schedule viewings on behalf, and even put together showing tours for you when you’re free for a day!